Posted: Wednesday, September 20, 2017. 2:18 pm CST. 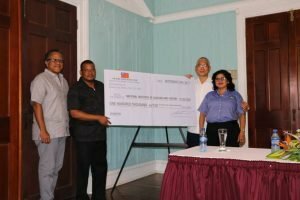 By BBN Staff: On Friday, September 15, the National Institute of Culture and History (NICH) was the recipient of a BZ $100,000 donation from the Government of the Republic of China (Taiwan) to assist in various programs of the National September Celebrations. Receiving the cheque on behalf of the National Institute of Culture and History (NICH), was the Deputy Prime Minister, Minister of Education, Youth, Sport and Culture and Chairman of the National Celebrations Committee, Patrick Faber. Handing over the cheque on behalf of the Government of the Republic of China (Taiwan) was Ambassador of the Republic of China (Taiwan) to Belize, Charles K. Y. Liu. Present at the event were Chief Executive Officer with responsibility for Youth, Sports and Culture, Adele Catzim-Sanchez and Greg Vernon, Acting President of the National Institute of Culture and History (NICH). The gifting ceremony took place at the Belize City House of Culture on Regent Street.